Races don’t always go as planned, and this was one of those races. 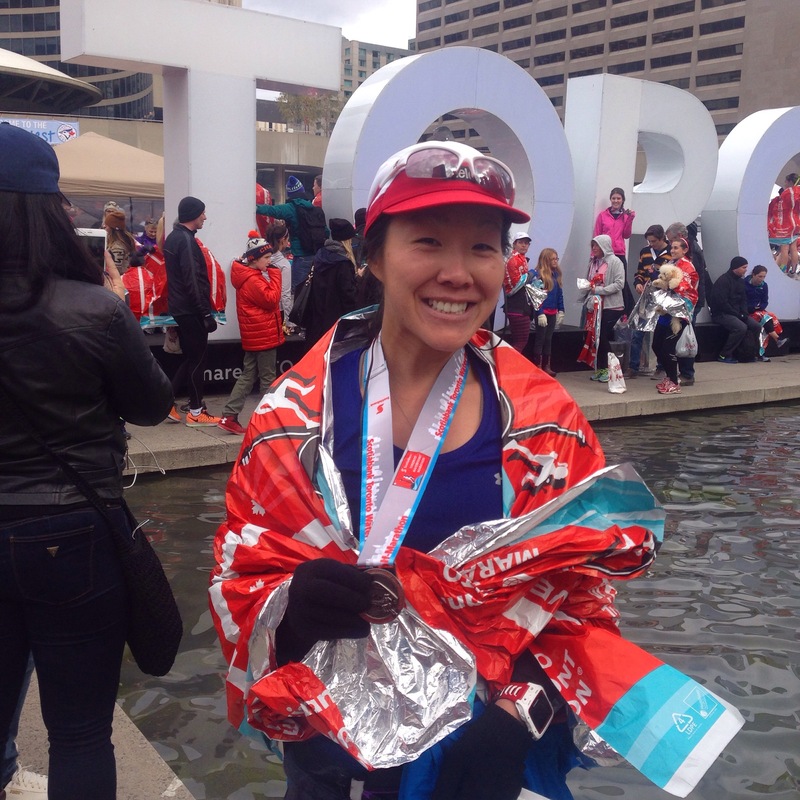 So, this race report recaps the Scotiabank Toronto Waterfront Half Marathon and not the Full. I planned to run the full marathon and was doing well until an issue with my Achilles in August forced me to take time off and keep my mileage low. I never made it past the 25-kilometer mark while training. I thought of trying to cram in a few long runs before race day and worked out a couple of different scenarios in my mind. I knew it wasn’t the best idea, but if you’re a runner who’s ever been injured, I’m sure you can relate. Fortunately, I have friends who aren’t afraid of telling me how it is. My friend Mike pointed out that I could go and run the full, injure myself, and then be out for even longer – maybe months, because Achilles injuries are slow to heal. No matter how much I disliked hearing that, I knew he was right. Dropping down to the half was a better decision than running the full and risking injury. Fortunately, Canada Running Series was understanding about not running a distance I hadn’t properly trained for, and allowed me to switch to the half. Race weekend started off with a visit to the expo on Friday afternoon to pick up my bib. I wanted to get there early to make sure there was a spot in the half marathon available for me. Switching race distances was pretty easy; I just traded my full bib for a half bib. I was sad, but there’s always next year! Although I didn’t have much time to spend at the expo, it seemed bigger than in previous years. Lots of vendors and booths to explore, and on my way out I ran into Bill from the Night Terrors Run Club! Yay for familiar faces! Friday evening, Canada Running Series hosted a dinner for the digital champions and community leaders. 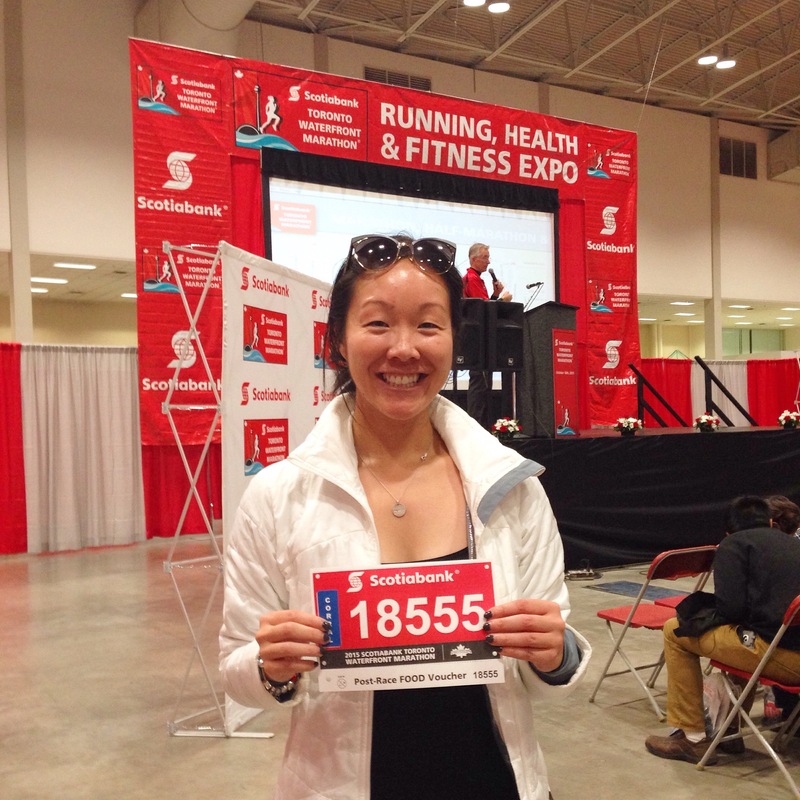 I chatted with some of the Canada Running Series staffers about organizing a race the size of the Scotiabank Toronto Waterfront Marathon. With more than 20,000 participants, it was interesting to hear about how many volunteers are involved, how early staff are required to be on-site race morning, and the work that goes on after the runners have finished – lots of action “behind the scenes” so that everything goes smoothly on race day. I thought the dinner was a nice way to relax and to chat with everyone about their plans and goals on Sunday. The forecast was calling for a chilly Sunday morning – the temperature at the start turned out to be around 3C (37F). I was stressed over what to wear – shorts and a t-shirt or tights and a long sleeved shirt? You’d think this was my first race or my first cold-weather run. Nope, I was just being indecisive and I didn’t like the thought of being cold! I finally settled on a t-shirt with arm warmers, shorts and a jacket, just in case. As indecisive as I was being, I also hadn’t figured out how I wanted to run the race. I’d been training to run a 4:30 marathon (10:17 min/mile pace) but started having stomach issues Friday night and hadn’t been eating much. Running a cold race on a nearly empty gas tank was going to be a challenging experience, to say the least. I figured if I could run at least a 2:15 I would be happy. The last time I had run the Scotiabank Half Marathon was back in 2010 and the course has changed since then. This year’s race started at University Avenue and Queen Street West. We then headed north on University to Bloor Street, ran west on Bloor then turned south onto Bathurst Street. The section on Bathurst was a slight downhill and it felt really fast. Before I knew it, we were on Fort York Blvd, and then headed west on Lakeshore Road until we hit the turnaround at Ellis Avenue. At this point, we were more than halfway done. The final kilometer north on Bay Street to the finish was tough! It was a slight uphill but there were tons spectators lined along the street cheering us on! For the most part the run felt pretty good! The half marathon route had a good mix of city streets and also took the runners close to Lake Ontario. It was well marked so you always knew where you were going. The course was fairly wide open from the beginning and there was always plenty of room to run the pace I wanted. There were more spectators out than I expected, and I was even surprised to see people cheering along the Spadina Road overpass. I finished in 2:07:02 (9:41 min/mile), which was much better than I anticipated given my stomach issues. At the finish chute, there were lots of volunteers handing out medals and space blankets and the only issue I encountered was on the walk to the finish area. I thought it was the number of runners finishing but it was actually the spectators who had crowded the exit. There was only enough space for two or three people to come out at a time and it was causing a backlog of runners out to Bay Street. It took me more than 10 minutes to get to the food tent after receiving my medal – most of which I spent standing still or walking very slowly. It wasn’t an ideal way to finish a race especially with the cold temperatures and the fact that runners need to keep moving after a race as part of their cool-down routine. While I initially had regrets about switching race distances, I surprised myself by running faster than expected without doing much speed work. While my finish time of 2:07:02 wasn’t a personal best, it made me think that with some work over the winter, I would have much better results for the half distance next year. 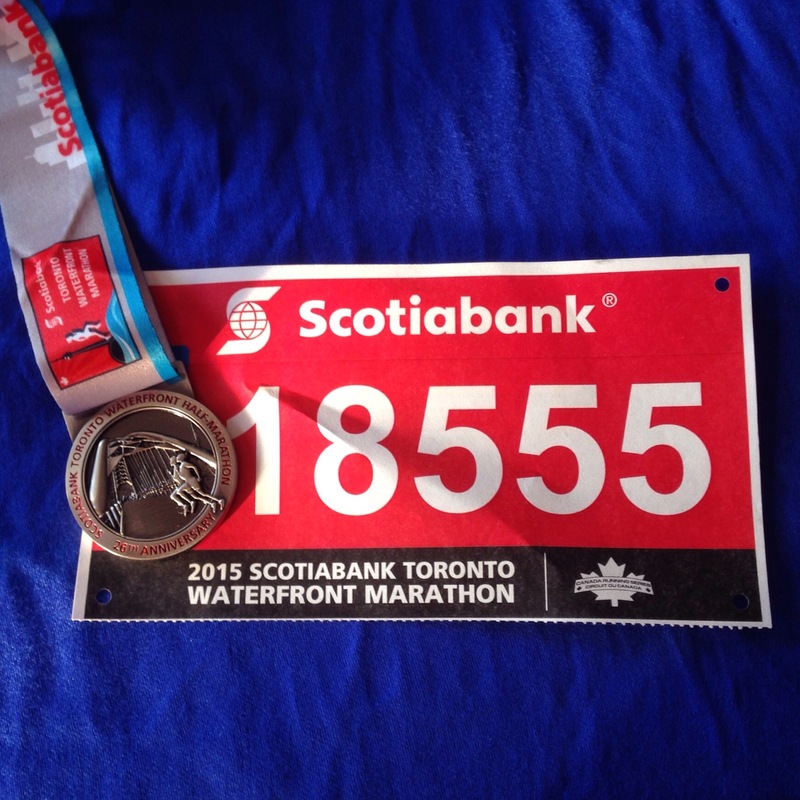 Aside from the finish-area issues, I thoroughly enjoyed the Scotiabank Half Marathon. From the volunteers, to the porta-potties, the course signage, and the well-stocked water stations, everything was well organized. Thank-you Canada Running Series and Scotiabank for hosting such a well-organized race! 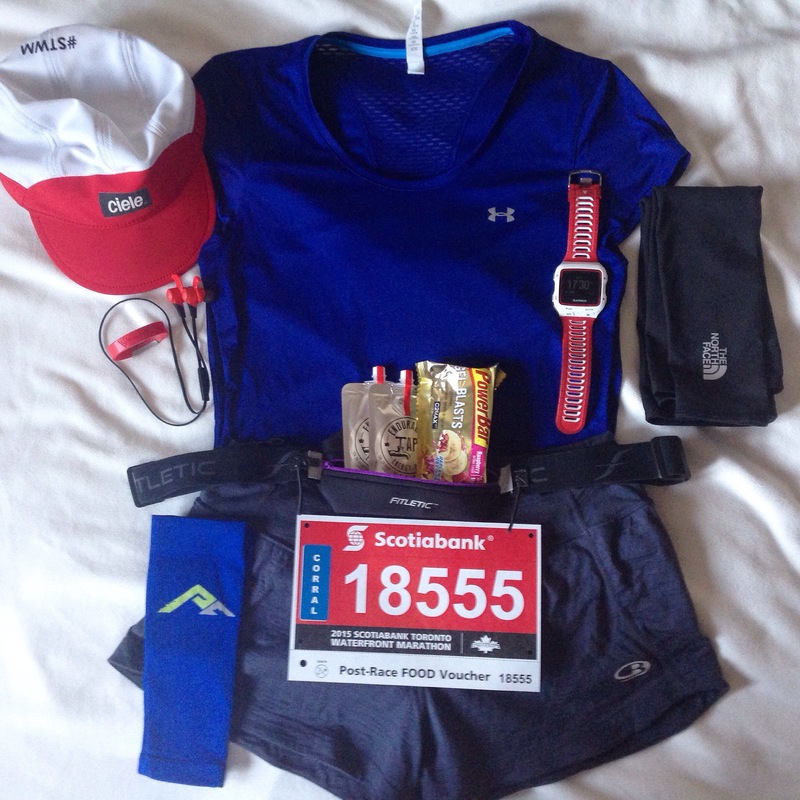 I hope to return next year to run the full, and I hope to see you there as well! 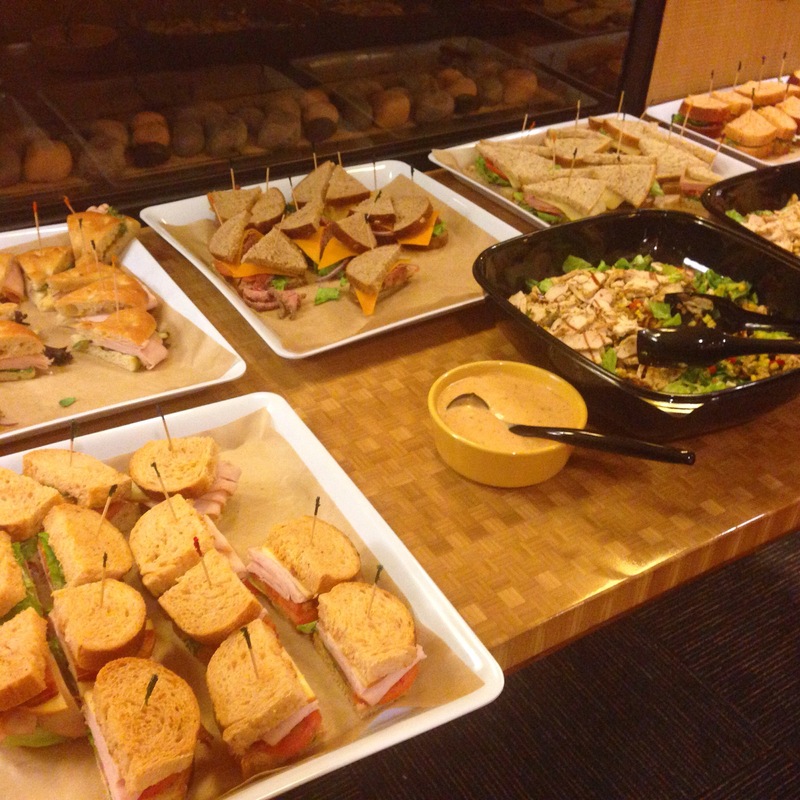 Previous Running, shopping and yoga … Oh my!